It seems I've inadvertently bunched all the useless deals together, though in all honesty, this group of deals are not as useless as the previous deal, it is nevertheless somewhat nonsensical. It seems to me, that generally, people learn to deal thirds, fourths and fifths to show off. Now, don't get me wrong, the deals can be employed to great success. For example, rather than stacking four aces on the top of the deck you can deal fifths till the first ace, then fourths till the next, then thirds till the next and so on. The problem with this concept is one must ask, "Why don't you just bottom deal?" The reality is that bottom dealing to accomplish the equivalent of this feat is much simpler. I personally have a case where I use thirds to help facilitate a ten-hand poker stack concept but it too shares a similar fault. If one is going to use false deals, then why bother stacking at all? It's a curious question, because some uses of a second deal may be classified in the same manner. You can use a second deal in order to simplify the stacking procedures you intend to use (though I hope that given the stacking concepts described earlier no one encounters the need in the future), but why not simply bottom deal? You could argue that perhaps the individual possesses an excellent second deal, but a poor bottom deal. That may be so for a second deal, but it is much easier to learn a good bottom deal than to learn to deal thirds, fourths and fifths. Thirds, fourths and fifths are then in my opinion a show-off technique. Which method of performing thirds, fourths and fifths is best, is I suppose a matter of debate. Briefly, the concept of doing so is roughly the same for both a push-off deal and a side strike deal, namely, the take is slightly different than that of a second. The reason for this is that you encounter difficulty with getting one and only one card as often the other want to come along for the ride so to speak. 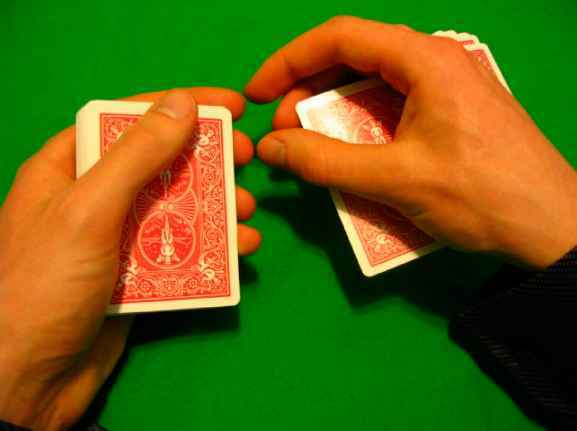 In order to solve this problem, with you perform the take, while your middle finger pulls the card out, you want to use your thumb at the edge of the card rather on top of the card and push towards the deck, effectively causing the bottom card (the one you want to deal) to free itself and come separately. Now in the case of a side strike deal it ends there, the deal is quite simple and quite deceptive, but with the push-off deal you encounter a second problem in pulling the cards back onto the deck, since often the cards will separate and you'll end up with so called "hangers", if you merely pull back with your thumb. In order to adjust for this fact, rather than performing your take to the side as normal, you perform your take in a much more forward direct away from yourself. This exposes the lower right section of the cards slightly to your pinky so that you may square up the cards with your pinky rather than attempting to use merely your thumb. Strike thirds, fourths and fifths are perhaps more popular, however, these constitute strike seconds of a different form. 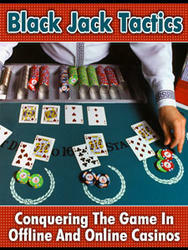 In essence, you push-off two, three, or four cards, but do so just slightly as you would for a push-off deal. Then, you strike the deck in the upper right corner much as you would for a strike second and perform a forward take, this allows you to make use of your last three fingers on the right side of the deck to square it and for you to continue with the next deal. There are numerous potential tip offs here, but the method is nevertheless quite deceptive and I won't traverse too deep into the concept. I will mention however, that I prefer this method to push-off thirds, fourths, and fifths, for myself. For those interested in the one-handed concept, I've heard stories of numerous methods in existence, but have developed none myself, though I have experimented with bullet thirds, which function virtually identically to bullet seconds. Since I tend not to use bullet seconds in practice and tend not to use thirds, I'm sure you can deduce how rarely I use bullet thirds. If anyone is supremely interested in the subject, perhaps I shall explore it at a later time in a later manuscript.